On Monday, October 7, 2013, indigenous nations and their allies held 70 actions throughout the world proclaiming their sovereignty. The call to action was issued by Idle No more and Defenders of the Land to coincide with the 250th anniversary of the British Royal Proclamation of 1763, which was the first document in which an imperial nation recognized indigenous sovereignty and their right to self-determination. As we wrote last week, treaties with First Nations are not being honored, and even the United Nations Declaration on the Rights of Indigenous Peoples does not adequately recognize the sovereignty of indigenous peoples. In Canada, where the Idle No More movement was founded, an attack is being waged by the Harper government on the rights of the First Nations. A bill referred to as C-45 weakens laws that protect the land and allows transnational corporations to extract resources from First Nations\’ lands without their consent. Idle No More was founded on December 10, 2012 (the anniversary of the Universal Declaration of Human Rights), when Chief Theresa Spence began a hunger strike to protest C-45 on an island across from the Canadian Parliament. 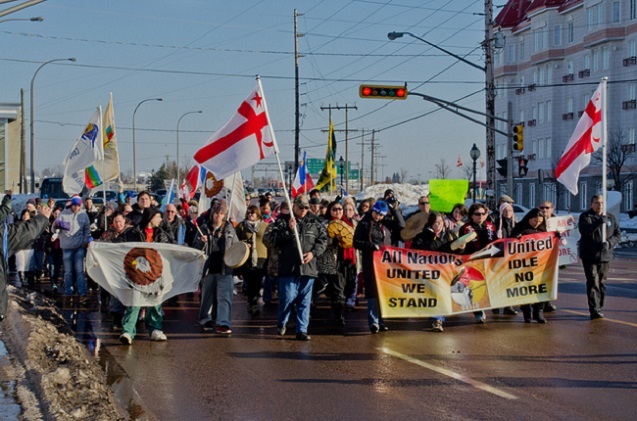 The Idle No More (INM) movement has grown exponentially during the past year to become a worldwide movement. At its core, the INM taps into issues that are essential to all people. INM is a struggle against transnational corporations that collude with governments to allow the exploitation of people and the planet for profit, and it is a struggle for a new economic paradigm. INM is also about facing up to the horrific history of the way that colonizers have abused and disrespected indigenous peoples so that there can be reconciliation and justice and so that the peoples of the world can coexist peacefully. And INM is about the recognition that indigenous peoples are stewards of the Earth and must lead the way to protect the Earth and teach others to do the same. Throughout the year, there have been teach-ins, round dances, flash mobs and rallies to raise awareness of the ongoing racist and exploitative treatment of indigenous nations as well as the continued decimation of their land to extract resources. There have been long walks, rides and canoe trips to call for healing of the Earth and for the recognition of indigenous sovereignty. And there have been blockades and other nonviolent direct actions to stop further degradation of the planet. INM has already achieved some successes. READ THE ENTIRE ARTICLE HERE: Indigenous Nations Are at the Forefront of the Conflict With Transnational Corporate Power That Affects Us All.